Having recently moved to a different city I can think of many benefits of using Emergency Profile. With having no records on my husbands previous checkups with his high blood pressure how nice it would be if it was all logged in the Emergency Profile so that we could just print if off and bring in to our new doctor. Emergency Profile would give a print out for my husband to carry with him in his wallet in case of an emergency so that he can get the proper help he needs at an given moment. It would give the doctor an up to date listing of what has been going on with my husband and his high blood pressure. 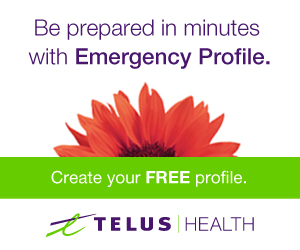 At first I was a little worried about internet security and sharing such personal information online even to be saved and accessed by only myself and my husband but Emergency Profile is exclusive to TELUS health space® and powered by Microsoft® HealthVault® and I only decide who has access to what information. One of the features I really liked about the Emergency Profile is that I can have access to my health profile on my smartphone so it is with me all the time. You never know when an emergency will happen and I would rather be safe then sorry.